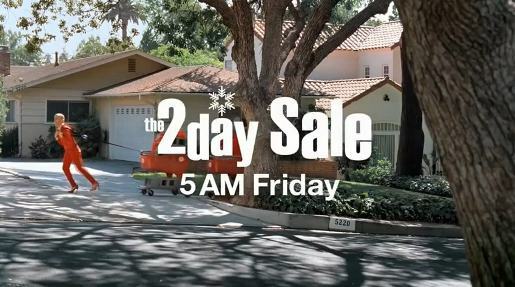 Target in the USA promoted its two day sale this year (Thanksgiving Day and Black Friday) with an advertising campaign featuring two sisters played by comedian Maria Bamford. Bamford plays two sisters who are getting ready for the Target 2-Day Sale. One is an overachieving overachiever who can’t wait for 5am, and the other is a frazzled everymom who’ll get there when she can. The campaign includes nine TV spots, eight radio spots, an interactive experience on Target.com and banner ads galore. Click on the image below to play the Target Wreath video. The Target 2 Day Sale campaign was developed at Wieden+Kennedy by creative directors Monica Taylor and Rob Thompson, copywriters Jason Kreher, Karl Lieberman, art directors Eric Baldwin, Rob Kendall, accouont mangers Bryan Tilson and Elisa Silva, agency producers Hayley Goggin and Melanie Fedunok, interactive producers Kris Hanson and Victoria Krueger. Filming was shot by director Matt Aselton via Epoch Films. Editorial work was done at Joint Editorial.